For this installment we reached out to Tom Iovino of Tom’s Workbench! 1- You are an Emergency Prep Manager, a weather nerd , a mac nerd, a tool nerd, a sports fan, a shop monkey, an educator, a cook, a husband and a father of two boys, never mind all the great blog articles you put out each week: where do you have time to fit in any shop time? It ain’t easy! Fortunately, I have a very understanding wife – and I don’t really watch a lot of TV at night. Getting out into the shop at the end of the day – even for an hour – is a tonic for me. Gives me a chance to clear my mind of the stuff that goes on during the day and get into the groove. I also like to take a chunk of part of the weekend – a few hours really energizes me. 2-Is it about the tools or the wood? The wood wins hands down. Tools are nice, but when there’s no wood (or no projects to work on), they sit out there in the shop by themselves. The wood – on the other hand – calls to me. And, when a board goes through the thickness planer, and I see the figure, color and grain pattern, there are moments when I still have to catch my breath. 3-What is the most surprising poll result you have seen? Just how many people hand-cut their dovetails. It’s an awesome skill to have, and I am jealous as heck of those who can cut them that way. Given the fact that a high-end saw and set of chisels will set you back more than the cost of a premium router jig, I thought more folks would go that way for sure. 4-How many pieces of furniture in your home have you built? Wow… I sure have built a lot of it. There are entertainment centers, blanket chests, desks… let’s just say that a big part of planning for projects involves deciding where they will go. 5-What sports will get you out of the shop? During football season, I end up going into my shop. The local radio broadcast of the Tampa Bay Buccaneers games is better than what’s on TV. But, I will get out of the shop for college basketball. And, coaching my sons in their basketball leagues will get me away from the bench and make me put down the Wood Magazine. 3-2 zone anyone? 6- I see you use a Tormek system. How many different sharpening techniques have you tried? How many fingers do I have to count on? I’ve done scary sharp (sandpaper), oil stones, diamond stones, a Work Sharp and then the Tormek. Each of these methods has its pluses and minuses… But, that Tormek really does make it easy. 7-You are a great story teller. I enjoy how you set up each story with an analogy. Is there a book in your future? 8-Being a self proclaimed weather nerd do you obsess about the current weather conditions and the effects they might have on your wood projects? 10-What tool do you own that is so bad, you would never think of giving it away to a friend or in good conscience sell on eBay. It’s a router bit. A lock miter router bit. I think I’ve spent more than 20 hours (over a few days) on that sucker and never got it to work. Ever. It sits in my shop – I can’t bring myself to throw it out, but I’d never give it away. 11-When creating a dado: table saw or router? Depends. I dig the table saw a lot. Plowing dadoes with a dado stack while using the rip fence is very convenient. But, the larger the piece gets, the more I rely on the router. 12-What project has been sitting in your shop uncompleted for more than a year? Many Many Thanks To Tom! I’d love to hear your feedback and suggestions. Who would you like to hear from? This entry was posted in 12 Lighthearted Questions, Inspiration by Christopher Landy. Bookmark the permalink. Another great round of questions, Chris. To Tom, as soon as you finish that office unit for you son, I’ve got a shaker table that needs finish. Fun questions and equally fun answers! 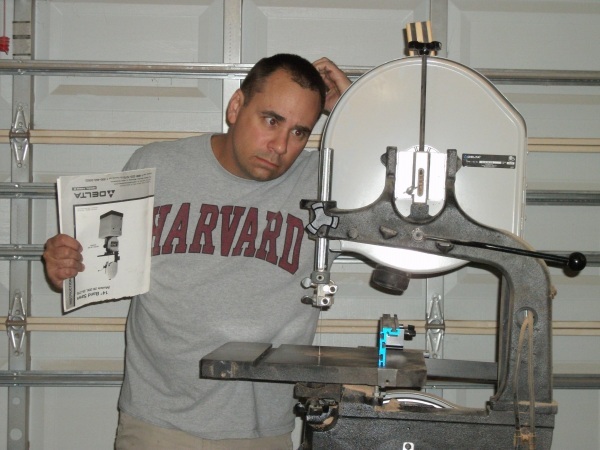 Tom, it looks like you’re having some trouble setting up your bandsaw. Obviously, the machine is upside-down. Just thought I’d help. Manual? Whats a manual? We don’t need no steenkin manual!